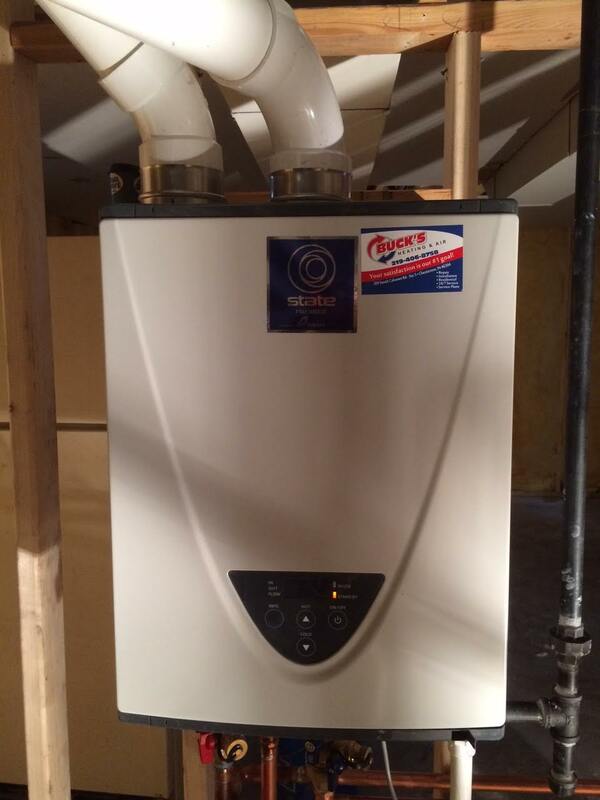 Endless hot water for your Northwest Indiana home or business. State tankless water heaters are an excellent whole-home water heating solution that supply endless hot water. Heating water only as it’s being used means you will never run out of hot water again. After the few seconds it takes for the water to reach the designated set temperature, the water heaters will continually provide a steady flow of hot water for as long as your application needs it. Tankless water heaters provide you with continuous hot water in one of the most energy efficient ways possible. Conventional tank-type water heaters will heat and store a set volume of water, regardless of whether someone is using that hot water or not. 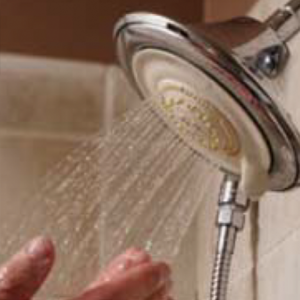 State water heaters only activate when hot water is being used. No standby energy losses are incurred, providing efficient heating while conserving energy. The compact size of State tankless water heaters take up much less space that your conventional tank-style water heater. With no tank to steal valuable storage space, the wall-mount design frees up valuable floor space and allows for additional storage and flexibility. A hot water tap is opened. The opened tap allows water to flow through the water heater. An internal water flow sensor detects this flow. Upon flow detection, the flow sensor sends the activation signal to the computer board. The computer automatically ignites the burner. 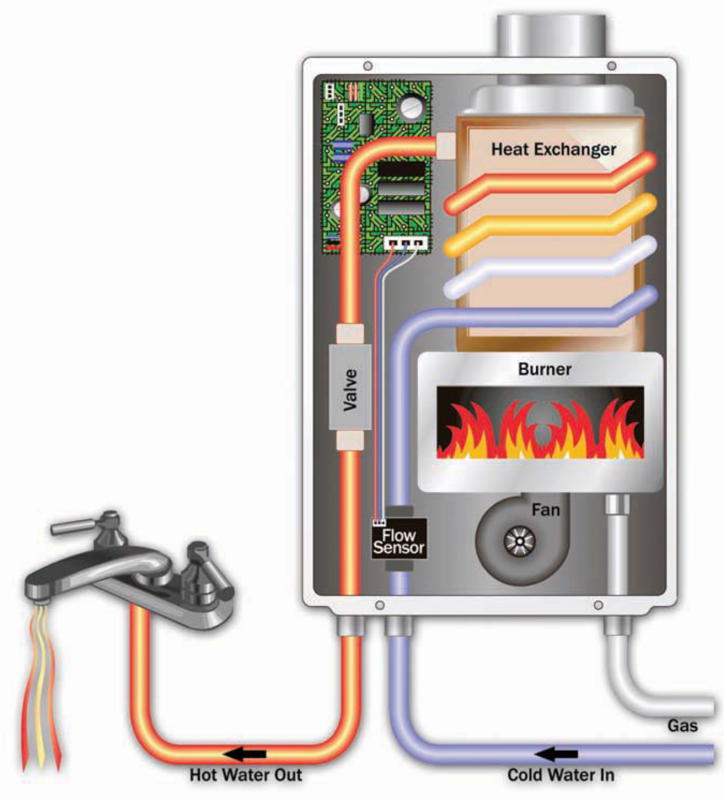 As water flows through the heat exchanger, it absorbs heat from the burner. By the time the water exits the heater, it has reached the designated set temperature. When the hot water tap is closed, the water heater automatically turns off. The State Tankless Water Heater 540H is well suited for residential installation. 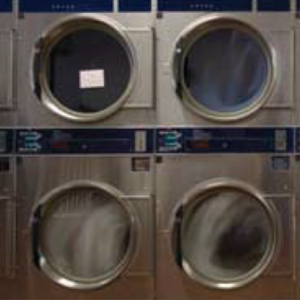 Performance and energy efficiency are maximized in households of four or fewer residents. The unit uses up to 199,000 BTU/h of natural gas to deliver a max flow rate of 10 GPM. It utilizes condensing technology to achieve an Energy Factor of 0.95, and is ENERGY STAR® qualified. This model meets Ultra-Low NOx emission requirements, and comes with a 15-year limited warranty. A remote control is included as a standard feature. Safety features include freeze, overheat, surge protection and troubleshooting diagnostic codes. Contact us today to talk to our staff about whether a State tankless water heater is the right choice for you.